Who’d have thought it? 7 years old, 364 I AMs, ain’t that something. There’s no chance they’d have believed you if you’d said to them 364 weeks ago that I AM would still be doing it 7 years down the line. 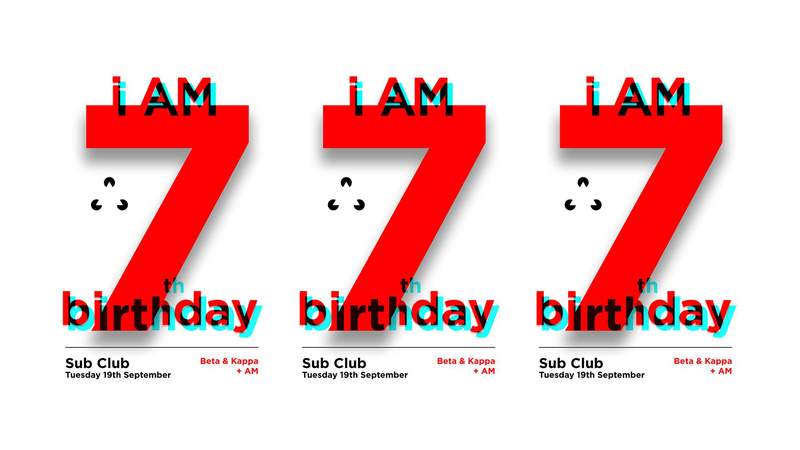 Thank you from the I AM & Sub Club to everyone who has danced, PR’d, DJ’d, or contributed in anyway shape or form over those 7 years. But what’s it all about? The music. Over to Beta & Kappa for 7 tracks. The first twelve inch I ever purchased may before i AM existed. So good I ended up with three copies and always play it when I’m struggling to settle nerves or i’ve played too much shite. Most addictive instrumental ever, still love it as much as I first bought it. My current favourite and most requested I.D. Now you all know and I’ll have to stop playing. Kidding on it’s getting played five times a week until you beg me not to. Not new but not “old” for synthy Italo. Pure Euphoria. Wow. I have such an affinity for heartfelt vocals. There are so many I could pick but this has been closest to my soul and played out the most perhaps. Our pal, Hector. He’s made so much great music but I have to pick just one. Probably my most played instrumental track on a Tuesday. Some great tracks seem to skim over the crowd and pass them by but I feel with this, it has an impact every time. So simple and short and perfect. The undisputed best Daft Punk Track. I’ve played most of their back catalogue out over the years but this has long long been my favourite (tho Revolution 909 is v v v close and yes Homework is the better album) and gets mixed unashamedly over anything that even half goes. It’s like mayonnaise. Or even better. It will be played at Enter Tron forevermore.